The 1931 Mendard County Courthouse sits at the south end of a long, narrow square in Menard, a town along the San Saba River in Central Texas. The building’s 1-story front entry section steps back to meet a 4-story central mass, flanked on each side by 2-story wings resting on a raised basement. The clay tile walls are sheathed in multiple shades of brick, arranged randomly, and decorated with cast stone detailing. Although the building’s plan and organization are relatively traditional, its stepped massing and simple, stylized detailing identify it with the “modernistic” mode of design commonly referred to as Art Deco. The courthouse shares the square with a 1966 swimming pool and a 1980 jail, but the building itself has had very few changes and retains a high degree of integrity. The form of the Menard County Courthouse is composed from several distinct masses of differing heights. The central section is four stories, abutted by shallow three story masses on the north and south with two-story wings flanking the east and west sides. The two story wings are, themselves, broken-up into three parts, with a taller and slightly protruding central section. The concrete walls of the raised, but unfinished, basement are exposed on the side and rear elevations, providing a visual base. The structural clay tile walls are sheathed in multiple shades of brick, arranged randomly, and pierced by symmetrically arranged metal casement windows. Bays are divided by simple brick pilasters that stop below the cornice. Instead of capitals, the pilasters feature an inset panel of cast stone with a stylized floral design resembling a Mayan hieroglyph. For all but the four-story section, the cornice consists only of a row of bricks laid in soldier course. A cast stone cornice, with repeating panels of a stylized floral design topped with cast stone blocks, caps the central mass. Additional cast stone details decorate the front (north) façade of the Menard County Courthouse. The somewhat unassuming location of the main entrance, centered in the protruding one-story section, is highlighted by its cast stone surround, with fluted pilasters on each side and the words “Menard County Courthouse” carved across the top. A set of steps, flanked by low concrete walls, leads up to the entrance, and a wheelchair ramp has been added up the center of the steps. Original light fixtures remain on each pilaster, and the original door has also survived. The three-story mass that rises behind the entry section is the most ornamental face of the building. Its central three bays are recessed slightly, separated by fluted cast stone pilasters with ornamental medallions above each one. Each of the section’s two end bays is also topped with a large cast stone ornament that features a heraldic shield bordered by garland. The façade’s metal casement windows vary in size and style. The building’s most common windows, which include an operable horizontal section below the vertically divided casements, were used on the two-story wings and the second floor of the central section. The remaining windows are simple casements with two vertically divided panes. The east and west elevations of the courthouse are identical, although the view of the east elevation is obscured by the 1980 jail building. The side elevations offer the clearest view of the building’s stepped massing. The form is nearly symmetrical, with the front distinguished by its protruding one-story entrance section and slightly more shallow three-story mass. A simple square boiler chimney is also visible rising from the rear. The width of the bays varies across the elevation, in an A-B-A-B-A pattern. The three central bays of the two-story wing are taller than the outer two, stepping up toward the central four-story mass. All of the windows across the two-story wing include the horizontal section below the casements, and several window air-conditioning units have been added in the horizontal openings. No windows were included on the sides of the three-story sections, and the four-story mass has smaller casement windows without the lower horizontal openings. The rear (south) elevation of the Menard County Courthouse, which faces the courthouse parking lot, is a simpler version of the front façade. The massing is essentially the same, but it lacks the projecting one-story entry and is only minimally decorated. The only cast stone used on the rear elevation is in the cornice and pilaster “capitals” of the four-story mass. A square boiler chimney, slightly taller than the central mass, rises from the intersection of the east wing and the three-story section. A small, shed-roofed storage structure has been added, extending from the east wing. Although the original transom is in place, the rear entry door has been replaced with a non-historic aluminum door and sidelights. The 1980 jail building, remodeled and expanded in 1993, sits just east of the courthouse building. The simple, rectangular building, designed by McDermott and Associates, was sheathed in multiple shades of brick in an attempt to match the courthouse. The building’s gabled roof, including the gable ends and small knee walls, is sheathed in corrugated metal. The interior of the Menard County Courthouse reveals a fairly traditional, H-shaped courthouse plan. The first floor includes most public offices and the small county court room. (Plan-19) Stairs at each end of the central section lead up to the second floor. Additional county offices are in the wings, with the district courtroom occupying the majority of the building’s central core. (Plan-20) The third floor is confined to the central section and includes the open space of the 2-story district courtroom, as well as its balcony, with a jury room and a storage space occupying the remainder of the floor. (Plan-21) The fourth floor of the courthouse housed the original jail, which includes the jail cells themselves and the jailer’s living quarters. (Plan-22) The integrity of the interior is perhaps the most remarkable feature of the building. The vast majority of original materials and finishes remain, including a large number of historic light fixtures. Except for the addition of a few ceiling fans, the district courtroom is virtually unchanged since its original construction. Only minimal changes have been made to the exterior of the courthouse, and it also retains a high degree of integrity. The building’s design and materials are almost entirely intact, both inside and out, also preserving evidence of the original workmanship. Its continued use as a courthouse has clearly maintained its integrity of association. Although the square and canal predate the 1931 courthouse and lend historical continuity to the site, the non-contributing jail, swimming pool and support building have altered the building’s historic setting and feeling. While these additions may detract from the aesthetics of the courthouse’s surroundings, they also reinforce its continuing and multi-faceted significance in the community. The 1931 Menard County Courthouse has served as the center of county government for over seventy years. Taking advantage of the lower construction costs and plentiful labor supply generated by the Great Depression, the county constructed the building to replace their 1885 courthouse and jail. Designed by successful Fort Worth architect E.G. Withers, with his partner Jesse Thompson, the courthouse followed contemporary trends in courthouse design, uniting traditional features with the “modernistic” forms and ornamental vocabulary of Art Deco architecture. The building’s dramatic stepped massing distinguishes it from most Texas courthouses of the period, however, and reveals Withers’s more sophisticated command of the style. For its longstanding service as the center of Menard County government, the courthouse is nominated under Criterion A in the area of Government at the local level of significance. It is also nominated under Criterion C in the area of Architecture at the local level of significance, as a well-executed example of Texas’s early modern courthouses. The San Saba River and its valley, which bisect Menard County from west to east, have supported human habitation for thousands of years. By the time the Spanish reached the valley, in the eighteenth century, they found enough Apache and Comanche residents to warrant the establishment of a mission, Santa Cruz de San Sabá, and a military fort, San Luis de las Amarillas Presidio, in 1757. The mission was burned to the ground by a group of Comanches in 1758. The Spaniards in the presidio endured constant hostility and poor conditions until it was completely abandoned in 1770. The presence of Apaches and Comanches continued to discourage settlement of the area into the mid 19th century, even after it was included in the 1842 Fisher-Miller Land Grant, in which the Republic of Texas gave more than three million acres to the San Saba Colonization Company to entice European immigrants to the valley. The United States government established their own military fort, Camp San Saba, in what is now the western end of Menard County in 1852. The fort attracted settlement and Menard County was officially established in 1858, with the town of Menardville (now Menard) named the county seat. Camp San Saba was abandoned in 1859, however, and many of the area’s residents left as well. The fort was re-established as Fort McKavett in 1868, encouraging new settlement and marking the beginning of Menard County’s modern history. With a rural economy based primarily on ranching, Menard County grew slowly but steadily through the end of the 19th century, reaching a population of 2,011 in 1900. Menardville established itself early on as the county’s commercial center, with 300 residents by the early 1890s. In 1910, the town used a number of incentives to persuade the Fort Worth and Rio Grande Railroad Company to extend their tracks to the town, which the railroad asked to be renamed Menard. The railroad provided access to new markets for the county’s livestock, and Menard thrived, its population growing to 1,000 by 1914. Despite the introduction of limited oil and gas production in the 1940s, ranching has consistently dominated the Menard County economy. Even in the 1980s, approximately 94 percent of the county’s land was in farms and ranches, and roughly 96 percent of agricultural receipts came from livestock and livestock products. The county has thus retained much of its rural character. After peaking at 4,521 in 1940, the county’s population returned to 2,964 by 1960 and has remained relatively constant at about 2,300 since 1980. As the county seat, Menard continues to serve primarily as a supporting center of commerce for the area’s agricultural economy, but tourism is an increasingly important industry for the town and county. The Commissioners Court ordered on May 13, 1884, that bonds be issued for the construction of a new courthouse and jail, and county residents responded by passing a $20,000 bond issue. The courthouse and jail were designed by architect T.P. Minor. The construction firm Vickery and Haynes of Kimble County submitted the lowest bid, $12,500, and was awarded the courthouse contract on May 12, 1885. A separate builder, Walker Mowath & Co., was used for the jail. A public privy was also erected for $209 by Scruggs & Schuchard. In the early 1930s, a good deal of controversy and discussion surrounded the construction of a new courthouse and jail and the fate of the 1885 buildings. A petition was circulated in 1930 calling for a bond election to build a new courthouse and jail. (Menard News Nov. 11, 1971) On September 8, 1930, a bond election was approved to seek the citizens’ endorsement of $80,000 in bonds, payable over 40 years at 5 % interest. The local newspaper, The Menard Messenger, and Commissioners Court minutes reveal the story of the 1931 Menard County Courthouse. The Menard Messenger reported on October 23, 1930 that the new jail would be separate from the courthouse, on a site east of the 1885 jail. The building would have a residence on the first floor, with the jail upstairs, and would be designed to disguise its function. The Commissioners Court, judge, sheriff, and other county officials prepared to visit several recent courthouses and jails for ideas, including those in Uvalde, San Antonio, and Eagle Pass. (The Menard Messenger October 30, 1930) On December 15, 1930, the county selected the Fort Worth firm of Withers & Thompson to serve as the project’s architect. Their plans and specifications were approved by the Commissioners Court on February 5, 1931. 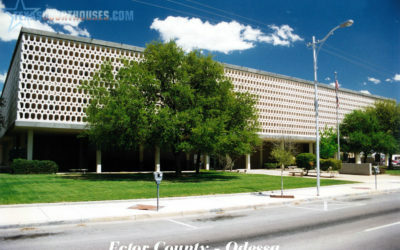 At some point, the county had changed their original plans, because by the time the plans were approved the jail was included within the courthouse building. During the month of February 1931, the cost of the courthouse and jail generated quite a bit of discussion. The search for a contractor began immediately, with a call for bids published on February 5. Rumors soon circulated that the Commissioners Court was planning to spend between $125,000 and $140,000, based on the request for bids. The request stated that, “the cost of construction and equipment of the proposed new Court House and Jail will be paid for as follows, to wit: Seventy Thousand Dollars ($70,000.00) in cash, and the balance necessary to be added to this sum to equal the contract price to be paid by the issuance and delivery to the contractor by the Commissioner’s Court legally issued interest-bearing warrants, etc.” As concern for the cost grew, a petition was presented to the Court, signed by 290 citizens, requesting that the Court not issue deficiency warrants without prior approval from the voters. The community was then invited to the February 20, 1931 Commissioner’s Court meeting to discuss the courthouse cost. The newspaper estimated that 12 or 15 businessmen attended the meeting and suggested that the total cost should be limited to $100,000. According to the newspaper, the Commissioners signed a statement that they would not enter into a contract exceeding $100,000, but this was not confirmed by the Commissioners Court minutes. Twenty-two bids came in on March 9, 1931, ranging from $135,000 to $176,000. All the bids were rejected for being too high, and new bids were requested immediately for review the following day. Five bids were returned, and E.D. Porter of San Angelo presented the lowest at $79,749. This bid was for the building and all built-in fixtures, not including plumbing, heating or moveable furniture. Several changes had been made to the original plans to keep the total cost below $100,000. The original plans called for a full basement, but that was quickly eliminated due to the cost. The Menard Messenger also reported on March 12 that, “several thousand dollars worth of marble was eliminated; a high-powered heating system was left out, a water cooling system was omitted; the cost of a tower clock was stricken off; and the jail fixtures originally included were disposed of. The old jail cells will be used.” Porter also reassured the reporter that he would use local labor whenever possible. As work began, W.E. Simpson, a consulting structural engineer from San Antonio, was called in to determine the best depth for the footings. He recommended a minimum depth of 9 feet, but preferred a depth of at least 14 feet. Two commissioners voted to put the footings at 22 feet, but the judge and other two commissioners went the other direction and agreed on a depth of 9 feet, which was where the foundation was set. Simpson was paid $60 for his consultation. On April 13, 1931, the brick contract was awarded to Elgin-Butler Brick through the San Angelo Building Material Company. According to The Menard Messenger, a petition signed by all the directors of the Chamber of Commerce was presented to the Commissioners Court requesting that the old jail be saved for “some general purpose.” (August 13, 1931) The Lions Club also supported the retention of the jail for use as a meeting space, library or other public purpose. Although the Commissioners stated that there was no hope of saving the 1885 courthouse, which would block the view of the new building, they agreed to wait on their final decision regarding the old jail, which would sit behind the new courthouse, until the overall sentiment of community could be determined. One final attempt was made by the citizens of Menard to save the 1885 jail. The Menard Messenger related details of an additional petition presented to the Commissioners Court, which asked to preserve the old jail “as a living monument to early day builders.” (September 24, 1931) This petition had many signatures of concerned citizens, but the Commissioners were not persuaded from razing the building. A request had already been made, in July 1931, to donate the stone from the 1885 courthouse and jail to the Pioneer Rest Cemetery, which was the course of action chosen by the Commissioners. The original bonds approved by the Menard Commissioners Court did not provide for heating, plumbing, electrical wiring, jail equipment or movable furniture. Thus on May 11, 1931, a tax of 25 cents on every $100 of property was established to pay for those items and to help cover the courthouse warrants. Twelve bids were received for the electrical, plumbing, and heating work. The Commissioners selected separate subcontractors from the combined bids that were received. A bid of $1,333.50 was accepted from Bunyard Electric Company on May 15, 1931. Along with doing all the electrical work, they were to provide three electric clocks for the courthouse: one for the Commissioners Courtroom, one for the District Courtroom, and one for the jail dormitory. On the same day, A.P. Kasch of Big Springs, Texas, was offered the plumbing and heating contract for their bid of $8,844.02. Four months later, on September 14, 1931, the West Texas Utilities Company of Menard was awarded a $750 contract for electrical lights and fixtures. On the same date, $250 was allocated for a bronze tablet, to be placed in the courthouse entry, listing all past and present county officials. Although the new courthouse and jail were originally scheduled to be completed on October 25, 1931, the paper reported in October that the buildings would not be ready for move-in until November 15. On November 19, The Menard Messenger published a photo of the new courthouse with a caption stating that the interior painting was nearly complete and preparations were being made to move in. No official acceptance of the building was listed in the Commissioners Court minutes and no ribbon cutting ceremony was found in the newspaper, but one would assume that the building was occupied by the end of 1931. Although the county most likely began using the new courthouse in 1931, furnishing the building would have to wait until the start of the new year. Costs had already exceeded $100,000, and the Commissioners Court could not solicit furniture bids until after January 1, 1932. An apparently pressing need was addressed almost immediately. Mrs. Will Nixon was ordered on January 11, 1932, to purchase furniture for the second floor Witness Room (then referred to as the Rest Room), not to exceed $500. It was not until two months later, however, on March 14, 1932, that the Commissioners Court accepted a furniture contract with the Dorsey Company of Dallas. The original bid was for $6,713.51, but it had been revised down to $3,908.51 in February. To pay for the furniture, Menard County Courthouse Equipment Warrants in the amount of $4,000 were issued at 6 % interest to mature over 4 years. It is difficult to determine a total cost for the 1931 Menard County Courthouse. The original bond of $80,000 was clearly inadequate for the substantial building that was designed, and even the revised one that was built. The Commissioners Court seems to have been continually issuing extra warrants to pay for items that were not included in the construction bid, such as furniture and plumbing. In addition to those costs, a vault and partition wall in the County Clerk’s office were not added until 1937. Although some have estimated higher costs, a review of the Commissioners Court minutes suggests that the cost was approximately $100,000 to $105,000. Withers designed the Menard County Courthouse during a brief partnership with Jesse C. Thompson. Although the 1930 Fort Worth directory listed the firm as Withers & Thompson, Withers was listed individually in both the 1928 and the 1931 directories. No additional information was found on Thompson. E. D. Porter was listed in the 1931 San Angelo City Directory as a building contractor at 1005 W. Avenue D. He was the general contractor on the 1930 Kimble County Courthouse, where he was also contracted to do the plumbing, wiring, and heating. Extensive research did not reveal any further information on Porter. Several repairs and changes have been made to the 1931 Menard County Courthouse since construction. As early as August 1937, the east roof needed repair. The roof was still covered under a 10-year warranty, so the county only paid for two yards of gravel. In August 1943, a contract for $897 was accepted from Probst Roofing Co. to repair the roof over the jail and on the south side of the building (near the jailers quarters). Yet another contract for roof repair was let in January 1947, to William Braley, before a major re-roofing project was undertaken in 1949. Probst Roofing Co. was awarded a $4,850 contract in March 1949 to re-roof the courthouse, except the jail and south wing, as well as waterproof and caulk the masonry and paint metal frames and woodwork. This work appears to have been more successful, as no other roof repairs were reported until the 1980s. The Menard County Jail occupied the top floor of the courthouse from 1932 until 1980, when the new jail was built. A small apartment, which served as the jailer’s quarters, was added to the fourth floor in 1940. An additional jail cell, known as the “dungeon,” was originally placed in the unfinished basement and used for prisoners too drunk or difficult to get up four flights of stairs. Without proper heating, lighting, or ventilation, conditions in the “dungeon” were often criticized. Although a cot was added in March 1937, the sheriff was ordered to discontinue use of the space in November of the same year because it was a hazard to a person’s health. That decision was reversed in August 1938, however, when a petition was made to the court for an urgent need to use the “dungeon,” and it continued to be used thereafter. Substantial repairs and changes, totalling $12,170, were made to the basement and first floor by contractor R. S. Ligon, Jr. in 1973. In addition to a good deal of interior painting, a suspended ceiling was added to the county judge’s office and the county courtroom, and floor tile was laid in many rooms. The storeroom in the basement was also added at this time, and a curved, Formica-covered desk was purchased for the county courtroom. In addition to its function as the center of county government, the Menard County Courthouse has also housed several other community uses. The Menard Messenger reported on November 19, 1931 that the new Boy Scout Troop was to have a room in the courthouse. Mr. Keen, a Methodist minister, was allowed use of one of the vacant rooms on the second floor on June 4, 1932, provided that he not cause any trouble when asked to leave the building. In May 1935, the Commissioners Court considered a motion that the Grand Jury room be vacated and reserved for the Grand Jury. The City of Menard was asked to pay $12.50 for the office space it used in the courthouse in May 1937. Additional bookcases were constructed in the County Courtroom in June 1937 for the storage of free textbooks for Menard County schools. Together, these isolated events illustrate the variety of functions that a courthouse must serve in a small rural community. Even today, the courthouse and square continue to serve as a social center for the community. The Parents and Teachers Association (PTA) has their annual auction at the American Legion Park. Veterans Day Celebrations are held every November 11th on the courthouse square. Santa Claus comes to visit the children of Menard County by meeting them at the courthouse and courthouse square. The historical celebration, “Jim Bowie Days,” has also been held on the courthouse square for the past 10 years. In addition to hosting these events, the courthouse square provides more informal opportunities for community interaction. The pecans that fall from the square’s many trees are considered public property and people often gather to collect them. During the summer months, the swimming pool is a popular attraction, and its location on the courthouse square reinforces the courthouse’s significant role in the community. The design of the 1931 Menard County Courthouse reflects a number of the era’s trends in the architecture of public buildings. Commonly referred to as “Art Deco,” a term derived from Paris’s 1925 Exposition Internationale des Arts Decoratifs et Industriels Modernes, the building’s style is more accurately understood as a combination of fairly traditional design concepts with elements of the new “modernistic” formal vocabulary associated with Art Deco architecture. The most influential aspect of this new vocabulary, especially in the United States, was the tendency to replace historicist decorative features with a rigidly geometric, stylized form of ornamentation. This method was applied to buildings’ defining formal components, like columns and cornices, as well as in limited areas of applied decoration, often in the form of low-relief sculptural carvings. While building’s designed in this style achieved a novel and modern “look,” what was inside the “envelope” remained relatively unchanged. In Architecture in Texas, 1895-1945, Jay Henry refers to this unification of the traditional and modern as the “Modern Classic” style, a term that applies well to the Menard County Courthouse. The building’s very traditional H-shaped courthouse plan, with the central courtroom flanked by supporting offices, is obscured by the modern look of its rigidly geometric, stepped masses and its limited, stylized ornamentation. The style is representative of the progressivism that defined the era, in which erecting a courthouse with a novel, “modernistic” design became a public assertion of the county’s commitment to growth and improvement. The Modern Classic style was the perfect solution for a county who wanted to seem progressive and forward-thinking without completely abandoning the familiarity, solidity and monumentalism of classical idioms. As Willard B. Robinson discusses in The People’s Architecture: Texas Courthouses, Jails, and Municipal Buildings, these attributes made the Modern Classic (or what Robinson refers to as “Stripped Classic”) style an especially popular choice for public architecture in the 1930s. (Robinson 1983: 262-269) The Menard County Courthouse is an excellent example of the style’s swift and widespread adoption, even in more isolated rural counties. The Menard County Courthouse’s dramatic stepped massing is a particularly striking feature of its design. While most Art Deco-influenced courthouses in Texas, and especially those in more rural counties, derive their modern “look” primarily from ornamentation, Withers’s design focused on the building’s form, and its complex massing maintains a strong visual presence on every elevation. Withers clearly understood the significance of form and massing to Art Deco architecture, which was then proliferating in Dallas and Fort Worth. It should come as little surprise then, that the two Texas county courthouses most comparable to that of Menard, Voelker and Dixon’s 1930 Cottle County Courthouse and Lang and Witchell’s 1928 Eastland County Courthouse, were designed by prominent firms from the Dallas/Fort Worth Metroplex. The building’s temple-like form and incorporation of Mayan motifs suggests that Withers was also familiar with pre-Colombian architecture. Although not uncommon in Art Deco buildings, the pre-Colombian influence illustrates Withers’s deeper understanding of the style’s precedents and creative possibilities. 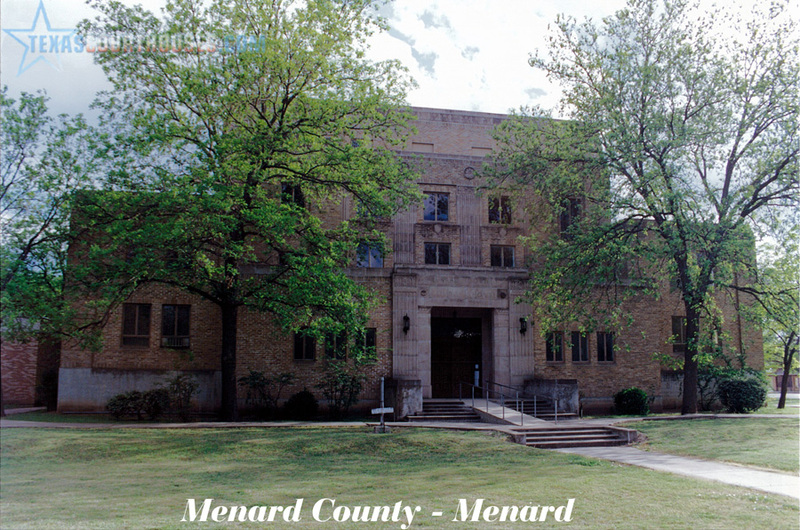 The 1931 Menard County Courthouse has served the local community for over seven decades. 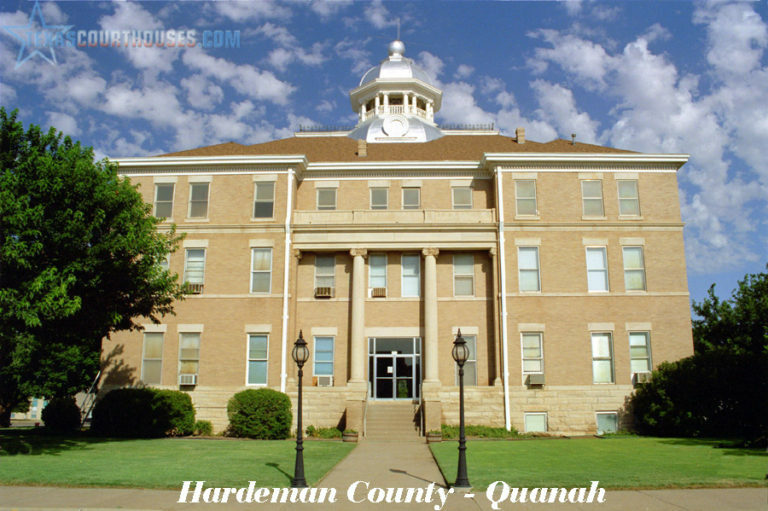 Beyond its formal role as the center of county government, the courthouse and its square represent the heart of public life in Menard County. The building’s design exemplifies the widespread influence of Art Deco architecture on Texas county courthouses, but also the tendency to retain some entrenched traditional features. Although it illustrates a common approach to courthouse design in the period, the building’s stepped massing and strong formal statement are atypical, revealing the architect’s exposure to and sophisticated understanding of the style. The Menard County Courthouse is therefore nominated to the National Register under Criterion A in the area of Government and Criterion C in the area of Architecture, both at the local level of significance.